On most days, Bill Dewey can be found wearing waist-high waders and inspecting Manila clams—the West Coast version of the littleneck—at his Washington clam farm, Chuckanut Shellfish. Under an arrangement that’s unique to the state, Dewey owns 32 acres of tidelands. Unlike land-based farms, he can only harvest when the tide recedes, leaving over a mile of mudflats, and shellfish, exposed. He gathers the clams with the help of a former tulip-bulb harvesting machine that’s carried out aboard his boat, the Clamdango! Commercial shellfishing makes up the lion’s share—two-thirds—of the nation’s aquaculture industry. So reports the National Oceanic and Atmospheric Administration’s (NOAA’s) Fisheries Service which makes a case for boosting domestic seafood production, noting that Americans eat a lot of seafood, and import 86% of it, creating a U.S. seafood trade deficit that now exceeds $10.4 billion annually, second only to oil when it comes to natural resources. In the Pacific Northwest, the shellfish industry contributes $270 million per year to the regional economy and employs more than 3,200 people. And when oyster cultivation fails at the top Northwest hatcheries and farms, the effects on the industry are devastating. Beginning in 2005, these oysters in the bay, known as natural sets, stopped reproducing. They have never successfully reproduced since. In 2006, the hatchery-produced Pacific oysters followed suit. In the hatcheries, spawning happens year-round in conditioning tanks where water temperature and algae levels (for food) are closely controlled. Both Taylor Shellfish and Whiskey Creek Shellfish Hatchery in Tillamook, Oregon, witnessed oyster larvae die-offs that they couldn’t explain and that continued for years. Initially, they suspected a bacteria known as Vibrio tubiashii was to blame. But even after Whiskey Creek installed an expensive filtration system, the oyster larvae continued to die. By 2008, Whiskey Creek, which alone accounts for 75% of all oyster seedlings used by West Coast oyster farmers, had lost 80% of its oyster larvae. Taylor Shellfish had lost 60%. Despite the controlled environment, the ocean water they were pumping into their hatcheries was corrosive. Upwelling—or deep ocean water rising to the surface following north winds off the Washington coast—was carrying acidic water to the surface. The shellfish farmers were experiencing the devastating impacts of ocean acidification sooner than researchers had anticipated. With support from Senator Maria Cantwell (D-WA), ocean acidification sensors were set up in 2010 near Washington’s hatcheries. Combined with Integrated Ocean Observing System (IOOS) buoys from NOAA measuring wind velocity, they track ocean acidity—and predict the upwelling events that cause increased acidity—in real time. Mark Wiegardt, co-owner of Whiskey Creek said: “Putting an IOOS buoy in the water is like putting headlights on a car.” Adds Dewey: “All of a sudden we could see all aspects of this water that was coming in our intake pipes. And it was quite eye-opening. We were seeing pH levels down as low as 7.5. Normally it’s 8.2.” To oyster larvae, it’s the difference between life and death. Over the past 100 years, levels of carbon in the atmosphere have risen 30%—to 393 parts per million. And the oceans absorb a third of that carbon dioxide, or approximately 22 million tons per day, in a process that Feely likens to adding carbon to water to make soda. Once it sinks into the water, the carbon dioxide reacts with water molecules to form carbonic acid; the carbonic acid then releases hydrogen ions which in turn combine with carbonate ions (the ones that shellfish and other creatures need) removing them from the water. Normally the process of oceans soaking up our excess CO2 is a beneficial one—keeping global warming in check. “Eventually, over a very long time, thousands of years, the ocean will take up 85-90% of all the carbon that’s released,” says Feely. “We thought that was a good thing.” But acidification is now happening at an accelerated pace, and it’s already changing the ocean in profound ways. It is nearly impossible to quantify the importance of coral reefs to people and the planet. In monetary figures, corals have been valued at $29.8 billion per year in net global economic value because they support fisheries, tourism and all the associated businesses, from hotels to restaurants. Reefs also protect shorelines from damaging storm waters and prevent erosion; they are the rainforests of the sea that provide a home for one million species; and they are “the medicine cabinets of the 21st century” according to NOAA’s Coral Reef Conservation Program, providing new sources of medicine to treat cancer, HIV, heart disease, arthritis and other diseases. Reefs are thriving underwater metropolises where fish spawn and hide from predators and bigger fish cruise looking for food. Sponges, the most primitive reef animals, house tiny fish in their cavernous tubes and vases as they draw seawater into their pores. The critically endangered hawksbill turtle, with its almond eyes, black spots and hooked beak, rests on the reefs feeding on these sponges while the vulnerable dugong, a flabby mammal with a wide snout and dolphin-esque tail, circles lagoons, feeding on the reef’s seagrasses. Shrimp and crabs are ubiquitous in coral reef environments around the world, hiding in crevices, providing cleaning services and enjoying the ready food supply. And of course the fish, of every hue and size and shape, with bodies designed to quickly maneuver through reef structures, fend off predators with scalpel-like spines, scrape algae and avoid stinging tentacles, all coexist in these incredible habitats. 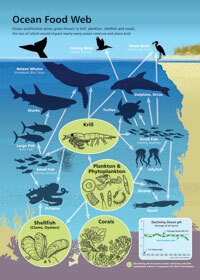 CLICK HERE to view full-size version of Ocean Food Web info graphic. Sometimes bleaching happens en masse as when 95% of corals in the Philippines bleached in 2010 after an El Niño event that raised ocean temperatures. Increased ocean temperatures also make the waters more stratified—preventing nutrient-rich water from below from rising to the surface and oxygen-rich water from reaching the middle layers. This can lead to more widespread losses. 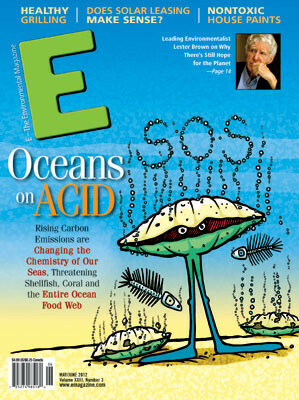 The Center for Ocean Solutions writes: “Between 1951 and 1993 zooplankton biomass off Southern California decreased by 80% as a result of warming surface waters.” Less oxygen reaching the interior, meanwhile, a product of both this increased stratification and significant nutrient runoff from farms, creates dead zones, a massive threat to marine life. And unlike nutrient runoff, which can be brought under control rather quickly, oxygen depletion that happens as a result of global warming can’t be easily reversed. CLICK HERE to view full-size version of The Great Barrier Reef info graphic. It would be hard to find an ocean expert who does not agree that global carbon dioxide emissions must be brought under control—and quickly—if we are to prevent the wholesale deterioration of our oceans. Most also recognize that such global agreements are the most difficult to come by, and that local protection strategies and efforts to reduce stressors on corals and marine life are important steps in at least staving off the impacts of ocean acidification and global warming. When it comes to reefs, designating reef environments as marine protected areas (MPAs)—and enforcing that designation—is essential to protecting habitat. But, notes the World Resources Institute, of the 400 or more MPAs in more than 65 countries and territories, there are only a handful that are truly large in scope—notably the Great Barrier Reef in Australia, the Florida Keys National Marine Sanctuary and the Ras Mohammed Park Complex in Egypt. Outside of these massive sites, they write “it is likely that less than 3% of the world’s coral reefs are protected.” And in many cases, such protections are on paper only. They cite the example of Johnston Atoll west of Hawaii, which was designated a federal bird refuge in 1926, and became the Pacific Marine National Monument under President George W. Bush in 2009. “Probably among the earliest designations of a coral reef protected area, this site has been subjected to massive military development, high atmospheric nuclear testing, chemical waste disposal, and other threats,” the institute notes. At the Great Barrier Reef, the world’s largest coral reef ecosystem at approximately 133,000 square miles (about the size of New Zealand), establishing the Great Barrier Reef Marine Park in 1975 was a first step, but not until the park was rezoned between 1999 and 2003 was the reef given the protection needed to rebound from threats that include shipping, dredging, commercial fishing, nutrient and pesticide runoff, coastal development and diving. Some 33% of the Great Barrier Reef is designated as a Green Zone, or no-take zone, where any activity beyond diving and underwater photography is prohibited or requires a permit. There are seven zones in total, which allow varying degrees of fishing, aquaculture, trawling and other activities, keeping them within managed limits. The restrictions have led to major recoveries of reef fish—including the coral trout and stripy sea perch—and declines in the crown-of-thorns starfish, a large starfish with up to 21 arms that lives and preys on corals, killing them in the process. The crown-of-thorns starfish proliferates in nutrient-rich water which comes as a result of unchecked runoff. Other fixes shellfish hatcheries can employ include filling the tanks later in the day, when the water has warmed and the pH has increased, and running the water over clam or oyster shells before filling tanks, which also increases pH. It’s an imperfect process, but workable, for now. What is critical to reducing the effects of ocean acidification surrounding coasts, says Spalding, is to protect and restore seagrass. Florida’s coasts, for example, have lost significant seagrass, in large part from dredge and fill operations. This seagrass is not only essential to provide habitat for fish, but the plants store CO2 in their roots, lowering the ocean’s pH. Mangroves, which are “forested wetlands,” serve the same function, and are similarly threatened, particularly by shrimp aquaculture. Since the 1980s, 20% of the world’s mangroves have been destroyed, according to the Food and Agriculture Organization of the U.N.
“One solution [to ocean acidification] is to make sure that we do everything we can to preserve and protect salt marshes, sea grasses and mangroves in particular,” Spalding says, “and be aggressive about restoring those that we’ve lost to recreate the carbon sink potential of the ocean.” If this restoration happened on a global level, it could help lower the pH overall; and there’s speculation, Spalding adds, that such strategies might work to control the pH of individual areas. As the Royal Society noted, however, the only real, overarching solution to ocean acidification is setting significant global targets for reducing CO2 emissions and sticking to them. In lieu of that, it means local communities—particularly coastal “hotspots”—must adopt ways to address ocean acidification using existing laws, according to a May 2011 report by Feely and other experts. That includes enforcing the federal Clean Water Act which requires the control of pollutants and runoff (both of which increase acidification), enacting zoning policies that address runoff and emissions and enforcing federal laws on emission limits.